Frank Darbo is a nice quiet man who does everything right. He's a good husband and friend, a diligent short order cook, he pays his rent on time, and he doesn't bother anyone. When Frank's wife leaves him for a local drug dealer and all around bad guy, Frank decides to take matters into his own hands and start righting some of the wrongs in the world around him. Along the way Frank picks up a sidekick and more than a little notoriety. His exploits don't go unnoticed by law enforcement either, adding another dimension to Frank's quickly growing mountain of troubles on his journey to save the world, his wife, his marriage and himself. Frank's crusade takes him on a journey through the seedier parts of town and his own mind as he learns what it takes to be super as a crime fighter and as a human being. 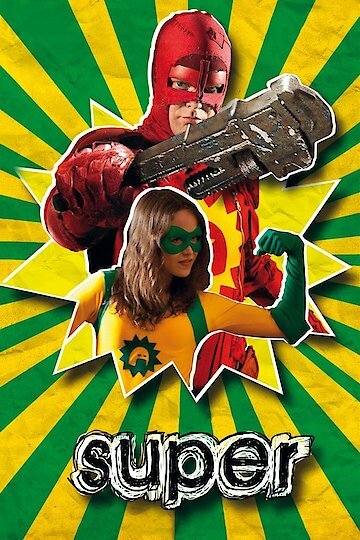 Super is currently available to watch and stream, download, buy on demand at Hulu, Amazon, Google Play, iTunes, YouTube VOD online.